This DURAC oven thermometer is individually serialized and features a round glass swell to hold the thermometer in place. 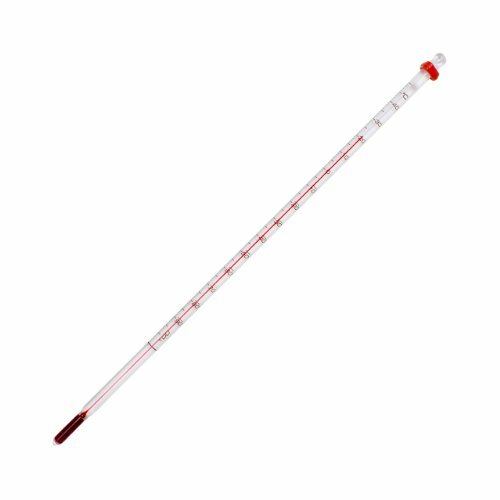 This 405mm (16in) thermometer has a partial immersion of 125mm (4.9in). It is individually packaged in recyclable packaging with a non-roll fitting. Range: 0 to 200°C. Divisions: 1°. Accuracy: 1°C; 1.5°C above 100°C. Length: 405mm (16in). Partial Immersion: 125mm (4.9in). Glass Back: White. Traceable to NIST: No. Traceable to DKD/PTB: No. PTFE safety coated: Yes. Thermometer Fill Type: Organic.